Dawn has broken over the East End and there goes Kevin, the agile milkman, sprinting down the street with a pint of milk in hand. With enviable stamina, Kevin Read gets up at two thirty each morning, six days a week, and delivers milk in a round that stretches from the Olympic Park in the East to Hoxton Square in the West, doing the whole thing on the run. 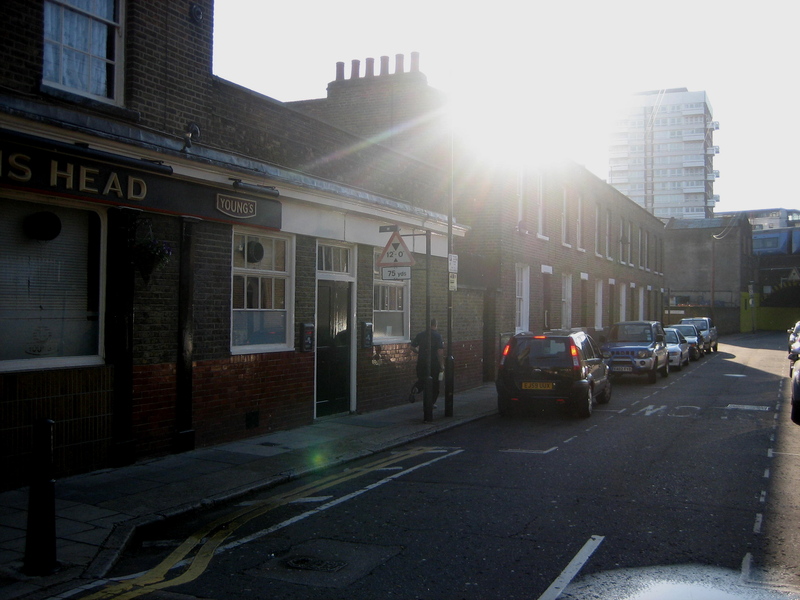 The East End is a smaller, more peaceful place in the morning, before all the people get up, and I was inspired to see it through Kevin’s eyes, when I joined him on the round yesterday at four thirty. As we careered around the streets in the early sunshine, travelling effortlessly from one place to another down empty streets that are Kevin’s sole preserve for the first three hours of daylight at this time of year, landmarks appeared closer together and the busy roads that divide the territory were quiet. Kevin’s East End is another land, known only to early birds. “I never look at it as a job, it’s my life,” admitted Kevin, still enthusiastic after thirty years on the rounds.“Born in Harlow. Educated in Harlow. Top of the class at school. Bunked off at fourteen. Failed all my exams. Moved to London at fifteen. Started as a rounds boy at the Co-op Dairy, just at weekends until I got a proper job. Left school at sixteen. Junior Depot Assistant at Co-op, swept yard, parked milk floats and made coffee for the manager. Don’t know what happened to the proper job!” said Kevin with a shrug, taking his life story at the same breakneck pace as he does his round. But, in fact, this was the mere prologue to Kevin’s current illustrious career, that began in Arnold Circus delivering milk to the Boundary Estate in 1982, where he ran up and down every staircase making a long list of calls for each block. Today, Kevin still carries his vocabulary of Bengali words that he picked up then. In the intervening years, an earthquake happened. The Co-op Dairy was bought by Express Dairies, then Kevin worked for Unigate until that was sold to Dairy Crest, next working for Express Dairies until that was also sold to Dairy Crest, and finally working for Hobbs Cross Farm Dairy until they went out of business. Quite a bumpy ride, yet Kevin persevered through these changes which included a dire spell in the suburbs of Chingford. “They complain if you put the milk on the wrong side of the doorstep there!”he revealed with caustic good humour, outlining a shamelessly biased comparison between the suburb and the inner city streets that were his first love. While we drove around in the dawn yesterday, Kevin told me his life story - in between leaping from the cabin and sprinting off, across the road, through security doors, up and down stairs, along balconies, in and out of cafes, schools, offices, universities and churches. No delivery is too small and he will consider any location. Yet it is no small challenge to work out the most efficient route each day, taking into account traffic and orders that vary daily. Kevin has two fat round books that describe all the calls he must do, yet he barely opens them. He has it all in his head, two hundred domestic calls (on a system of alternating days), plus one hundred and thirty offices, shops and cafes. “A good milkman knows how to work his round,” stated Kevin with the quiet authority of a seasoned professional. Setting a fierce pace, always quick, never hurried, he was always thinking on his feet. With practiced dexterity Kevin can carry six glass bottles effortlessly in his bare hands, with the necks clutched between each of his fingers. He makes it all look easy, because Kevin is an artist. The wide chassis of Kevin’s diesel milk float permits him to cross speed bumps with one wheel on either side – avoiding chinking milk crates – if he lines up the float precisely, and during our seven hours together on the round, he did it right every time. But, returning to East End, Kevin discovered his customers had become further apart. Where once Kevin went door to door, now he may have only one or two calls in a street, and consequently the round is wider. Between three thirty and eleven thirty each morning, Kevin spirals around the East End, delivering first to houses with gardens and secure locations to leave milk, then returning later to deliver milk to exposed doorsteps, thereby minimising the risk of theft, before finally doing the rounds of offices as they open for business. During the day Kevin turns evangelical, canvassing door to door, searching for new customers, because many people no longer realise there is a milkman who can deliver. Kevin is a milkman with a mission to rebuild the lost milk rounds of the East End, and he has become a local personality in the process, celebrated for his boundless energy and easy charm. Now happily settled with his new partner, whom he met on the round, he thinks he is delivering milk but I think he is pursuing life. Am I having a deja vu? As long as it’s about Kevin and his devoted, efficient and clever way of covering the milk route that he has brilliantly expanded, I will happily dwell in the notion that I might have met Kevin before. Wishing that I might have a regular delivery of such fresh milk here in New York. What an inspiring story I love the fact that milk is still delivered . Few people can say they love what they do. What a truly lovely story. One of my favourite memories of the time we spent in the UK back in 1981 was having the milk delivered each day on a little electric float. The milkman always had time for a chat and could usually be relied upon to come up with some local news. One memorable happening was just prior to Christmas when a neighbour invited him and us in for a wee drop of something warming. We ended up having several of those drops and then came outside to find that the float has meandered off down the road a way – fortunately it was a fairly level culdesac so no harm was done. We also were fortunate enough to have the mail delivered by a gentleman who was,at the time, the oldest Postman in the UK. He rode a very venerable old bicycle; the only time he pushed it was when there was snow and ice on the ground, and he was over 90 years of age at the time bless him. This was in Rayleigh, Essex SS68TQ by the way. I really hope that your locals support you in your effort to keep this priceless service going – we need more of this individual and personal style of shopping. All the best to you. Wish we had the likes of Kevin in Canada.What a lovely man.Good job well done. Thank you for writing such a delightful article about Kevin’s world – such a dedicated and hardworking milkman. I hope he is still doing his East End milk run. Our best friend in London also met her milkman, Bob, and they are still happily married 20 years on. When visiting from Australia we used to love staying with her and our daughter, aged 2 then, used to love having a ride on his milk float. Now we stay with them in Gloucestershire. For the past 10 years we lived in Clapham and sadly the milk run has been discontinued there! Well done Kevin your a trooper. Loved this article. Where I live there hasn’t been milk deliveries for 40 years. I have fond memories of our friendly ‘milko’ delivering bread and milk everyday. At Christmas we would make up a treat for him and his family to say ‘thank you’ and good cheer for Christmas holiday.